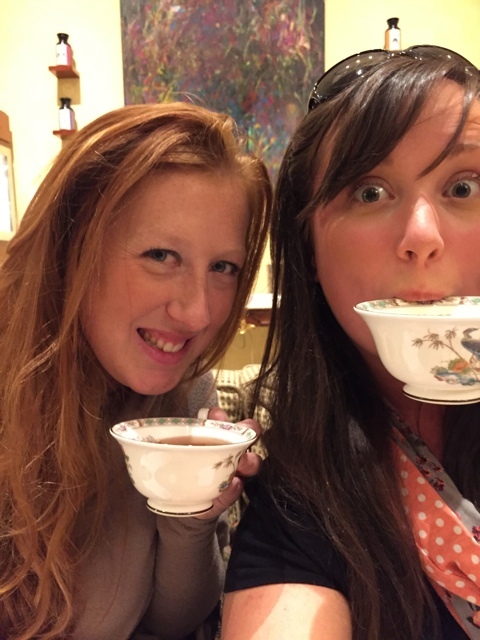 My good friend Candice and I enjoying a lovely afternoon tea! I recently had a quick one night stop-over in Berlin to visit my good friend Candice while flying from Prague to London. 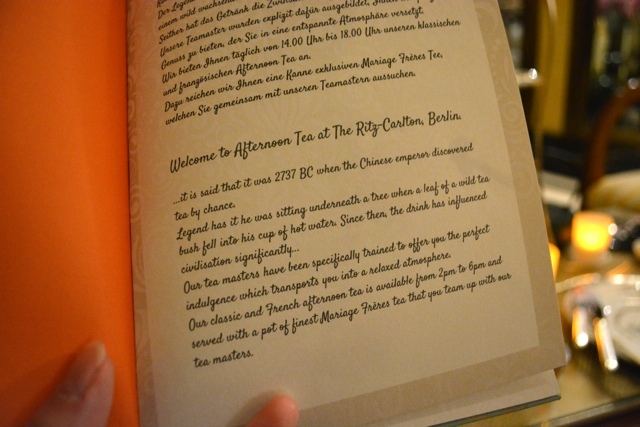 While there I wanted to do something fancy and what better fancy thing to do then enjoy a fabulous afternoon tea at the Ritz-Carlton, Berlin? 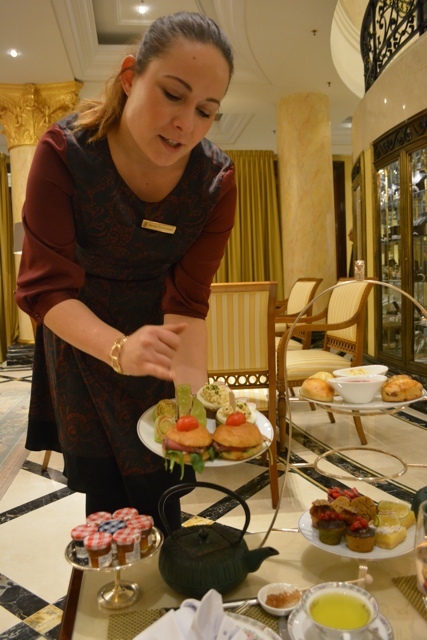 I was also excited to do this as it was Candice’s first time ever enjoying an afternoon tea as well. 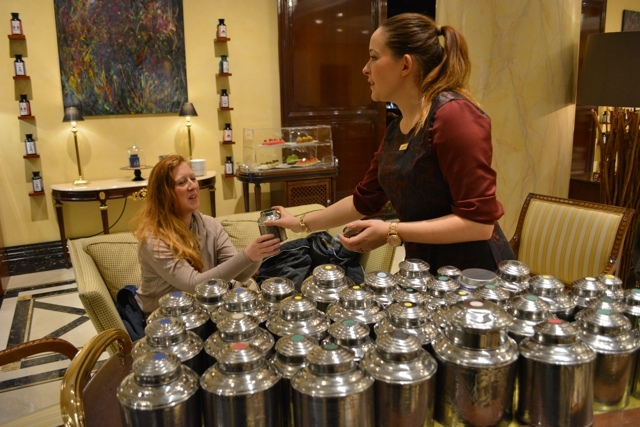 Our tea started at 3pm and we were welcomed to the tea lounge in the lobby by the Ritz’s very own tea master aka sommelier. Just the fact that they have a tea master shows you that they mean business. Oh and also the 60+ different types of tea that are available for your drinking pleasure. 60! Tea smelling and selecting is hard! It was very hard to chose which tea to have. 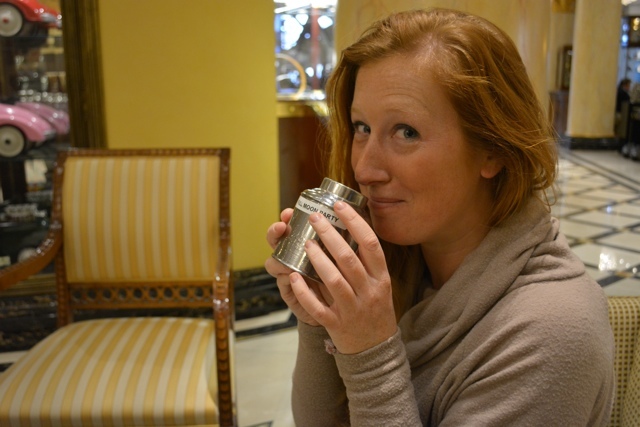 We asked her a million different questions, we kept changing our minds and asking to smell a million different teas. 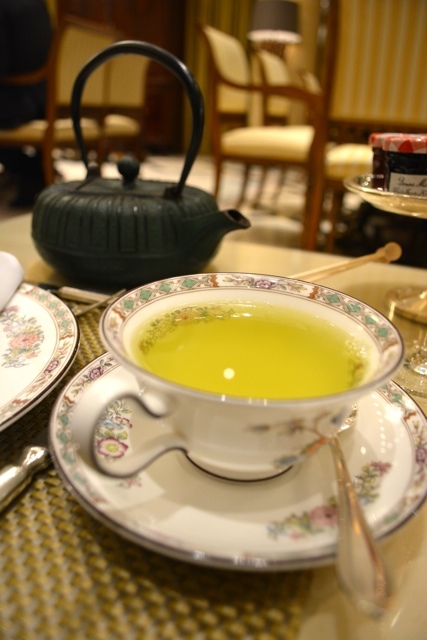 I finally went with a favourite of the sommeliers and enjoyed the Tanka Cha green tea from Japan. It was delicious. Every good afternoon tea also starts with a glass of champagne. Ours came with a flower floating amongst the bubbles! Delicious! Loved the ornate Asian tea pots as well. The Chef delivered our tasty eats! As we wait for our tea we are also served a glass of bubbly. 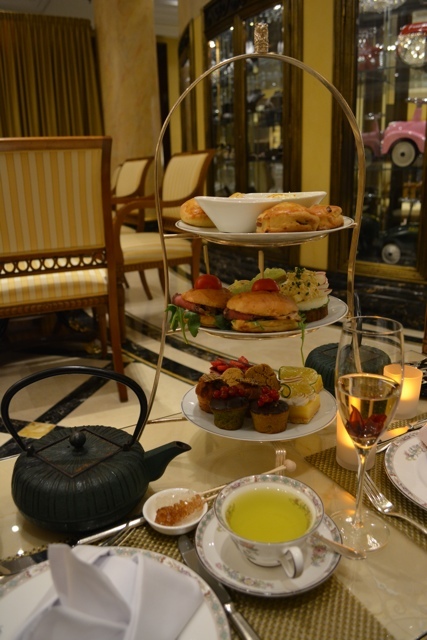 It is always a sign of a good afternoon tea when it starts with champagne or rosé. 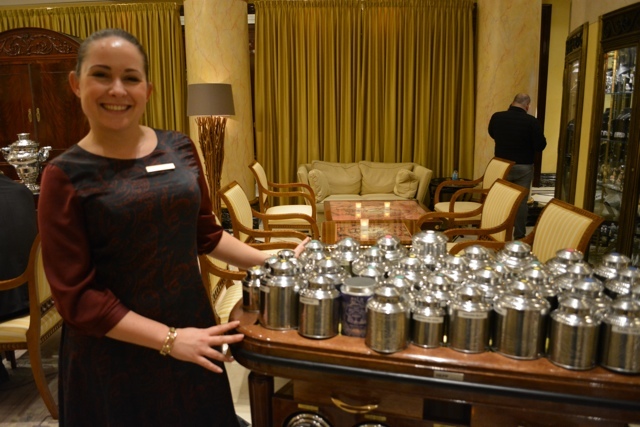 Our tea is brewed and then served in our own individual ornate tea pots. 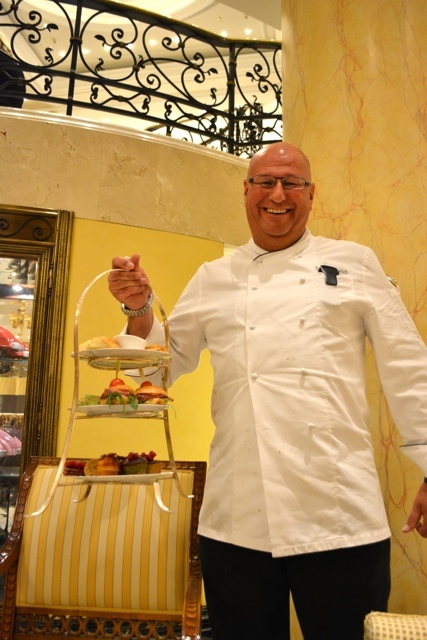 Then comes our delicious sandwich, scone and dessert tea stand served by the chef with all of our delicious eats for the afternoon. Eat the savoury sandwiches first! 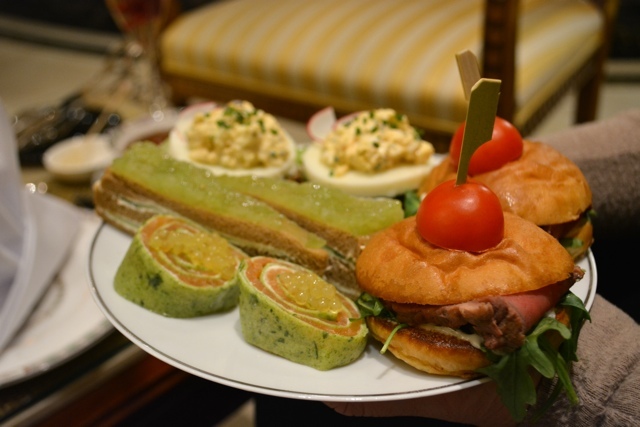 Traditional savoury afternoon tea sandwiches with a Ritz-Carlton fancy twist. Salmon wraps, cucumber sandwiches, open faced egg sandwiches and tasty roast beef sliders. One of my favourite parts a myriad of desserts! 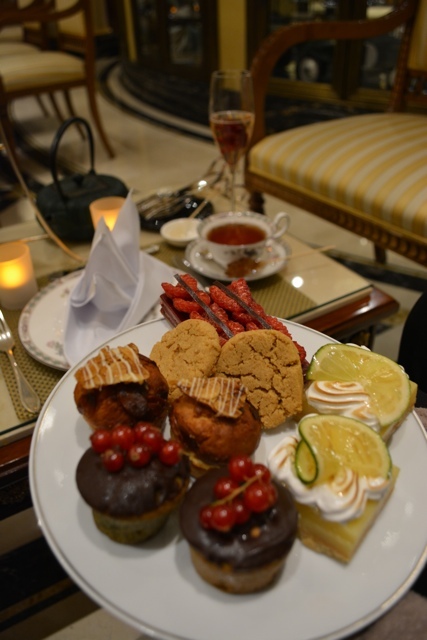 The afternoon tea is served at the Ritz-Carlton from 3pm – 6pm. Typically the average seating is probably 1.5hrs to 2 hours long. Candice and I however enjoyed it so much that we stayed all afternoon. By the time we were ready to leave we were there just to see the Ritz-Carltons award winning Curtain Club do its official opening ceremony for the evening. 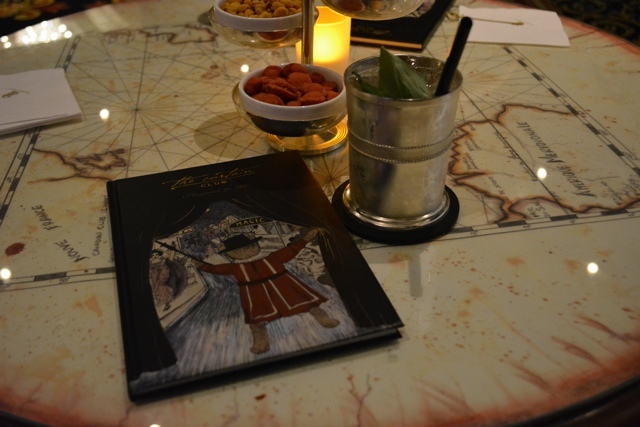 It would have been rude for us to see this official opening and then not visit the bar for a drink from its award winning menu. 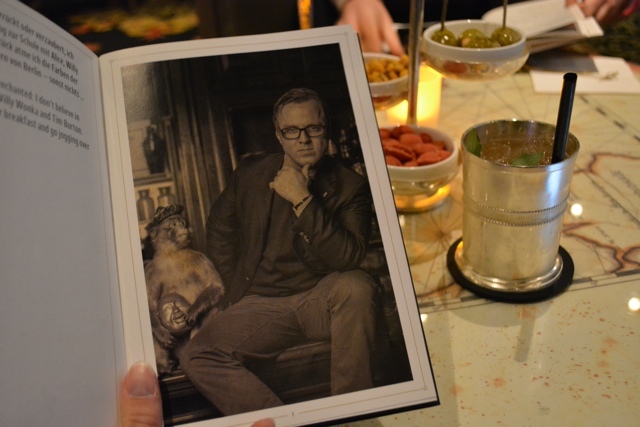 We also had the chance to meet the head bartender who is a wizard of mixed drinks. He asked Candice what her favourite perfume was and in minutes had made her a tasty drink that she loved and it even included gold flakes! This guy is a genius. 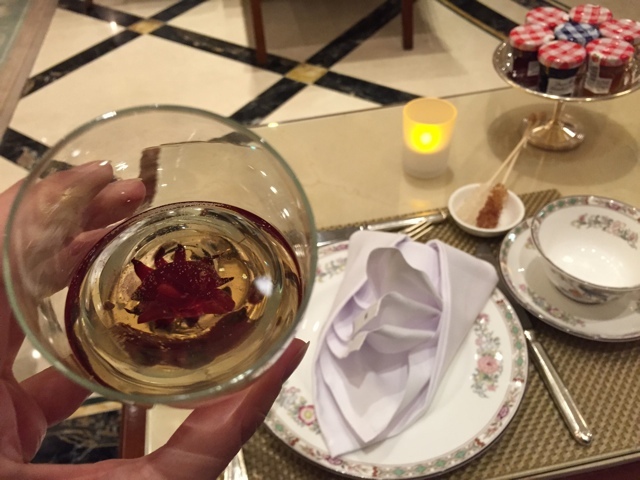 Our afternoon tea at the Ritz-Carlton Berlin was a fantastic experience and was one of my favourite afternoon teas to date. 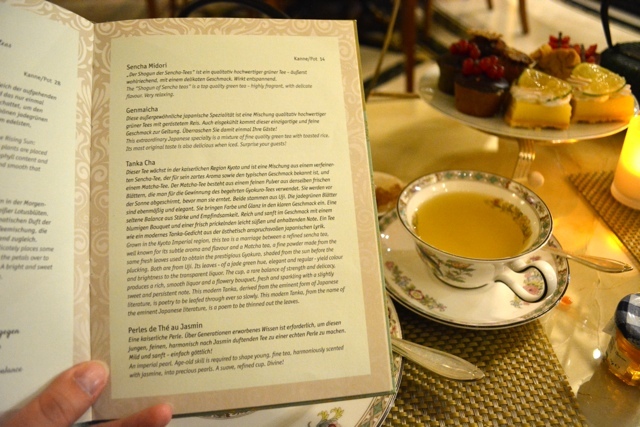 An afternoon tea might not be an activity high on your list when you are thinking about planning a visit to Berlin, but it is one that I would highly recommend. 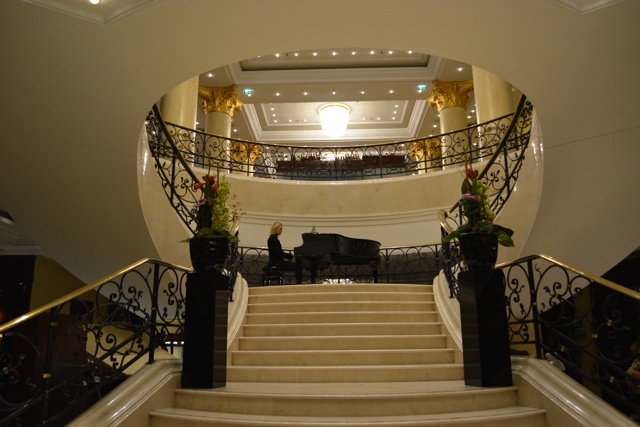 Special thanks to the Ritz-Carlton Berlin for having me. As usual all opinions and views expressed are my own as are my satisfied tastebuds. 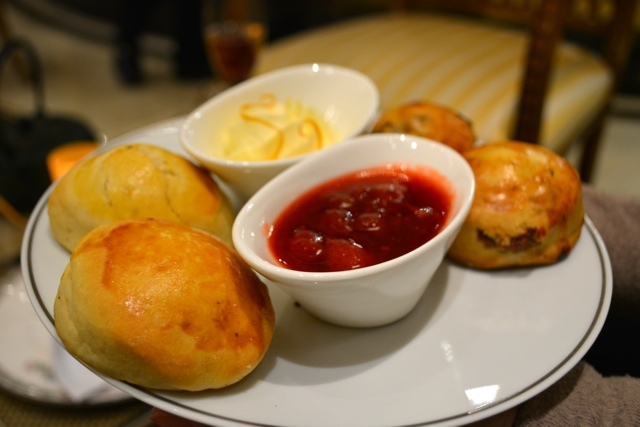 I’ve always wanted to attend a fancy high tea … nice to know that I’ll be able to do it in Berlin!